Modeling and Simulation represent one of the most challenging problems in engineering and computer science. Solving the challenges of today and tomorrow requires an in-depth understanding of the technical issues with the knowledge and skills to develop creative solutions using the right technologies. The Tellus Visual Simulation Toolkit was designed to address a broad range of visual simulation applications using the latest advances in gaming technologies combined with engineering and database tools. Tellus brings together these technology features into an affordable, easy to use simulation environment targeted at the full spectrum of simulation applications that require everything from up close character animation, indoor and outdoor scenery generation and vehicle physics to highly customized engineering analysis tools, training applications and mission planning. 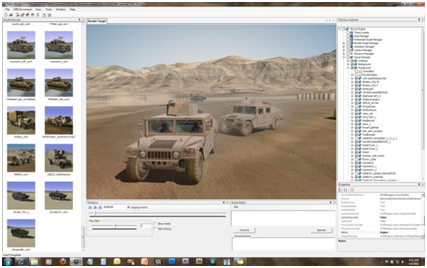 At the core of the simulation toolkit is the Tellus Engine. The engine provides the object management, simulation support and rendering functions used to simulate and display objects on the screen. Most of this is transparent to the end user who is presented with a visual representation of the environment. The engine itself is a modular, plug-in based component for the Tellus Application Framework using Windows .NET technologies and the DirectX graphics API. Central to a visual rendering system is the scene graph where we connect objects, logic and code to control how the scene appears to the viewer. Efficient scene management is essential for real time, interactive rendering and controlling the flow of information to the graphics hardware. The scene graph is composed of a number of subsystems that manager various aspects of the data including how it is loaded and saved to disk, animated and rendered to the screen. The scene graph components can be extended through a Tellus Plug-in Manager for loading external files. Components compiled with the Tellus SDK function as native components once registered with the environments Plug-in manager. A core component of the Tellus Engine’s scene graph is the Planetary System for geospatial simulation. The Planet System performs on-the-fly construction of geospatial elements including atmosphere, terrain surface, building and other features along with simulated objects. The planets are connected to source data through open standard web services that provides image, vector, objects, metadata, and elevation layers. Time of Day lighting and shadowing are modeled with support for seasonal effects, weather, and atmospherics.